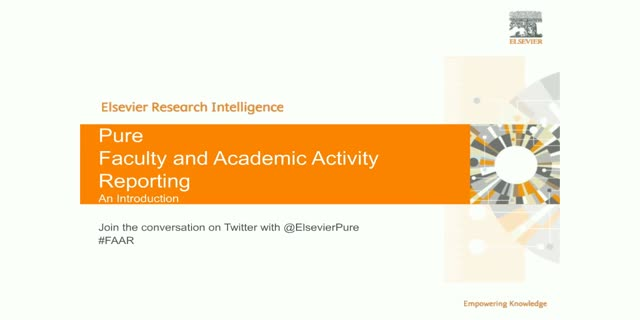 Elsevier is pleased to announce the addition of Faculty and Academic Activity Reporting (FAAR) capabilities into Pure. Based on customer feedback, faculty activity reporting capabilities have been created in order to allow universities to understand the full spectrum of activity on campus, from courses taught to research output in a single system. Pure is a research information system that aggregates and links data from numerous internal and external sources, such as the library, HR, finance and even researcher CVs. With Pure, uploads can be automatic, reducing tedious data entry exercises and keeping the information up-to-date with little manual work. Join us for an overview of the recent launch of recommendations to Funding Institutional, powered by Scopus Author Profiles. In this webinar presented by Andreea Serban, Product Manager, you will learn how current users can take advantage of this new feature. Andreea will also share tips for getting the most of Funding Institutional. While this webinar is intended for current clients of Funding Institutional, we also welcome all those who might be interested to learn more about our future plans. Where do I have a seat at the table, and in which research areas is our Institution making a significant contribution? What are the latest updates to Topic Prominence in Science, which will save you significant time, provide unique insights and help develop your research strategy? >> Where am I a Key Contributor? In which Topics is our institution’s research output the most impactful and how is this measured? >> Analyze Related Topics in Trends. Discover related areas of research and broaden your understanding of a chosen Topic.